Climate change. Telematic surveillance. The gig economy. Transgender rights at work. Food security. Native advertising. 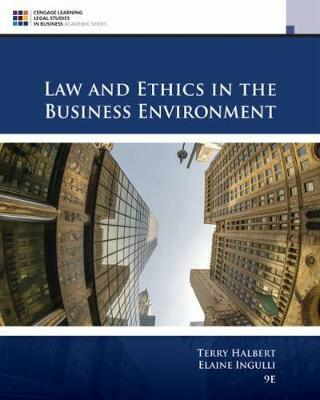 Now you can take a closer look at the hot topics impacting business law and ethics today as you examine real applications in the thought-provoking LAW AND ETHICS IN THE BUSINESS ENVIRONMENT, 9E. This edition dives into current controversies and makes classroom discussion with your instructor and peers come alive. Content prompts you to carefully consider recent, important court cases, while readings challenge you to think critically about contemporary legal and ethical dilemmas. Interactive assignments, such as role play, mock trials, and negotiation exercises, sharpen your ability to tackle tough problems and communicate effectively.